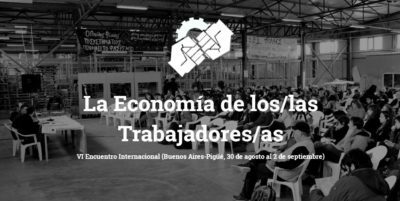 In this interview we talk to Andrés Ruggeri, anthropologist and researcher who directs the Facultad Abierta programme (Open School) of the University of Buenos Aires, dedicated to researching and supporting workplaces recuperated by their workers. Ruggeri tells us about the history of this movement, the challenges it faces, the relations with recent governments in Argentina, and much more. Ricardo Vaz: Can you tell us a bit about this programme, Facultad Abierta? Andres Ruggeri: Facultad Abierta (Open School) is something that in Latin America is usually known as a University Extension, understood as the university function that is dedicated to the community. Usually these have to do with cultural aspects, courses, workshops, and this issue has also been commodified recently. We started the programme in 2002. In the School of Philosophy and Literature of the University of Buenos Aires we set up a tiny extension unit to work with social movements, popular movements, that were flourishing at the time, among them the recuperated workplaces. We quickly turned to the subject of worker self-management, or workers’ control, on one hand doing research, and on the other taking part in the processes, trying to support the organizations that emerged. RV: So it is not just a matter of doing research and documenting. What is, so to say, the contribution in the opposite direction? What do recuperated workplaces look for from Facultad Abierta? AR: We never come with an attitude of telling the workers that “this is what needs to be done,” rather we look to work on a joint analysis of the issues, that will help with self-management. There are many aspects to it. One of them is actual participation: spreading information, supporting the occupations, collaboration in specific tasks, as well as articulating with other professionals. For example, we work with engineers, lawyers, accountants, people from the exact sciences, that may on occasion collaborate with a given company. At the same time through the canvassing of recuperated workplaces, and the reports that are always discussed with the workers, we are generating a body of knowledge. I think at this point the work of Facultad Abierta is something that the movement has embraced as one of its tools. There is a documentation centre of recuperated workplaces that works out of a cooperative which is Imprenta Chilavert. There we document an endless number of things that have fuelled this relationship, as well as share the day-to-day life of this cooperative. At this point, it is sometimes hard to tell apart what is the movement and what is Facultad Abierta. 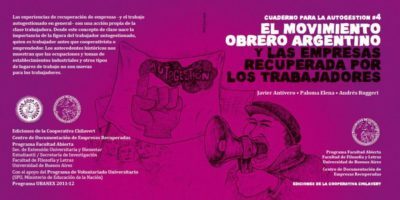 Facultad Abierta also edits the “Cuadernos para la autogestión,” (“Self-management notebooks”), produced at the Imprenta Chilavert. 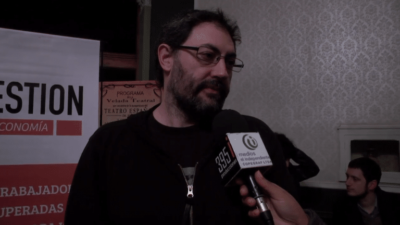 RV: Does the movement also extend its reach beyond the Argentinian borders? AR: Yes, another important development are the international meetings, called The Economy of the Workers. This was also an initiative of ours, in 2007, but it now extends far beyond Facultad Abierta. These are meetings that bring together workers, activists, movements, and researchers. These international meetings were planned to be held once every two years, and later regional meetings started taking place in the intermediate years. Last year we had the sixth international meeting, with participants from over 30 countries, many different recuperated workplaces from around the world. It took place in Textiles Pigüé – a recuperated factory from the south of the province of Buenos Aires. Billboard for the VI International Meeting Economy of the Workers, which took place in 2017 in Textiles Pigüé. RV: The recuperated workplaces [note: we will often use the Spanish acronym ERT (Empresas Recuperadas por sus Trabajadores)] emerge strongly with the crisis in late 2001. Were they building on an existing tradition? AR: Argentina is probably the Latin American country with the oldest history of cooperativism, dating back to the late XIX century. It is related to the history of migration and the emergence of the workers’ movement itself, just like in Europe. The workers’ movement, trade unions and cooperatives, emerge more or less in parallel, before diverging over time. But a certain tradition of cooperativism remained, even if generally separate from the question of production. With the implementation of neoliberalism, in the late 1980s and early 1990s, there was a shift in the economic structure: the country starts getting de-industrialised, lots of production chains are destroyed, resulting in lots of unemployed workers. Some unions, very few, start to promote and form cooperatives in the companies that were being shuttered. They were mostly small metal workshops, print shops, these kinds of companies. And the unions were essentially of metalworkers from the south of Greater Buenos Aires, from Quilmes, and the Buenos Aires Graphics Federation. Then in some locations in the interior other cooperatives also sprung up, as means of resisting against this process. RV: Is it fair to say that these are more cases of abandoned companies than of occupied ones? AR: It is a bit of both. Actually the workers occupy companies that are being abandoned, it is a simultaneous process. When the bosses are looking to close doors, or when there is a fraudulent bankruptcy, that is the moment when the occupation takes place. In the 1990s, we estimate there were around 30 cases in which cooperatives were set up, because there were many others in which it was attempted but it was not possible. RV: Do new cases of ERT keep appearing after 2001? 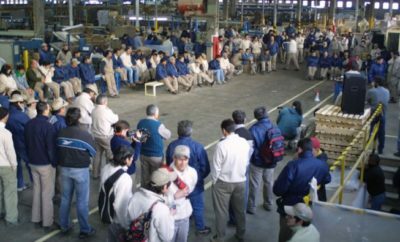 AR: According to our estimation of currently existing recuperated workplaces, which is around 380 with some 16.000 workers, there have been more recuperated workplaces after 2001 than the ones that took place at the time. The thing is that in 2001 there was a tremendous concentration of occupations, with massive mobilisations, with lots of social and political impact. RV: In terms of the relationship with the state, how was the relationship between the Kirchner governments and the ERT? What was their perspective? AR: Kirchnerismo was very contradictory in what concerns recuperated workplaces, just like they were with many other issues. Nevertheless, they were not hostile to recuperated workplaces, even if they did not particularly favour them. Within their neo-keynesian conception of development, workers’ control and all of this did not really fit. All of the state’s policies for economic recovery were geared towards – and with great success for the most part – recovering employment and production by focusing on the internal market, but with a national bourgeoisie leading the way. Then as the economy recovered, all these expressions such as cooperatives, small companies, even social movements, would tend to disappear because people would go back to formal employment, thus strengthening the unions. This was the plan. In that sense, the Kirchner governments collaborated with the ERT, with some programmes of subsidies and support. But never with an economic policy, it was rather a social policy, of managing conflict, with the perspective of helping people that had lost their jobs and formed cooperatives. However, ideally these people would go back to work in the formal job market. Naturally the entire policy of kirchnerismo had this idea as its base, but it morphed over time. At some point, especially with the international crisis in 2008-2009, we see that the economy is troubled and that it cannot meet this goal of full employment. Then state programmes for creating cooperatives appear, although these were “cooperatives” in which the state paid salaries and said what was to be done. In the end you had a kind of two-faced policy, in which the cooperatives seemingly did not fit but were fostered at the same time. AR: Precisely. 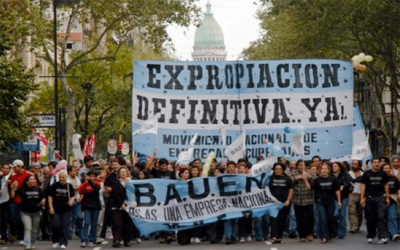 And a significant debt of kirchnerismo towards the recuperated workplaces was that it did not contribute to solving the judicial problems that have lingered and are now a liability for many ERT, such as the Hotel Bauen.1 These are usually disputes surrounding property. Not necessarily with the former owners, but since these are often bankrupt companies, they are still involved in legal proceedings, there are still creditors, who want to collect debts with property. The property is in the hands of the workers, but not legally, and that creates many problems. RV: How was this sector affected by the arrival of Macri? AR: We produced a report midway through 2016, and subsequent events proved us right. The general economic policy of the Macri government affects cooperatives just like it affects all aspects of the productive economy destined towards the internal market, small and large companies alike. These are the common effects of neoliberal programs, especially in Latin America. It is a policy dedicated to weakening the working class, to lowering salaries in favour of an economy designed for the exporting of raw materials and energy, and for the prevalence of financial capital. The results are massive layoffs, both in public and private sectors, a decrease in the purchasing power and the consumption capacity of the population. As a result, production goes down, demand goes down, cooperatives cannot fight against that, they need to accommodate. To this we must add the opening up to imports. There are very cheap products coming in especially from China, and national production, cooperative or otherwise, cannot compete. Finally there is the tarifazo, which is something incredible that has multiplied utility costs in a way that completely breaks cooperatives. Many recuperated workplaces, for example, currently have gas bills that are higher than their revenue. This means they either not pay or try to stop their electricity from being cut off, but this does not stop debt from building up. The goal is somehow to buy time, waiting to see if there is a change in the political arena. RV: Beyond its economic policy, does the government have an ideological position with regards to the ERT? AR: Besides the economic choking there is a constant hostility and, when an opportunity arises, the government acts against the recuperated workplaces. The clearest case is the Hotel Bauen, which never saw its situation regularized, it was never expropriated. There was an attempt to do so in the last parliamentary session with the previous correlation of forces of kirchnerismo, it then went to the Senate when Macri was already in office, and Macri vetoed the law. The same thing has happened to every expropriation bill coming out. The law of expropriations was a mechanism that we had managed to put in place as a way to legalise the ERT. Macri will always use some pretext, but ideologically he is clearly against everything that has to do with workers’ control. This in turn is reflected on the judges, who are ever less inclined to helping the workers. AR: Definitely not. Nevertheless, on labour matters there have often been more or less favourable rulings, as the judicial power is also influenced by mobilisations, by the political context. When the political context was a bit more favourable there were decisions that prioritized the continuity of production, the safeguarding of labour as opposed to the seizure of assets. The bankruptcy legislation was modified, in 2011, to offer a legal way out for bankrupt factories and companies so that they were taken over by workers’ cooperatives. But this always implies putting pressure on the judges. All of this is now much more difficult. The judges that by nature are against the working class are now much more so. Another thing that macrismo is trying to do is to stop factories from being recuperated. The factory closes and the police is there to ensure that it does close, avoiding any occupation. They stay one step ahead to stop workers from trying to occupy. RV: Can you describe the relation between trade unions and ERT? Because they operate with different logics. AR: Trade unions, with the establishment of fordism and of the welfare state, have occupied a place that is generally understood, by the organisations themselves as well, within the framework of struggle, or negotiation, between capital and labour. But the traditional base of the wage-earning, formal worker, has been shrinking with the rise of precarious and informal work, and most of the unions retain a “classical” mindset, they have not found a way to represent these new kinds of workers. In general it is hard for them to think about what happens to a worker after he loses his job. Some unions simply do not care because they can no longer extract anything from this worker, neither a union fee nor a social security contribution.2 But leaving the corrupt unions aside, the ones that take part in fraudulent closures of companies in exchange for something from the bosses, the traditional union will go as far as trying to stop the company from shutting down, to stop the workers from losing their jobs. However, once these jobs are lost, there is nothing left to do. This is the approach, more or less. Then there are some unions that have asked themselves: if we do not manage to stop the closure, because there is a general policy, an economic context that leads to this, what do we do? That is where the support for eventual recuperated workplaces appears. Some unions have long understood this issue, and others are coming to grips now. RV: Are these, for the most part, smaller unions? AR: Yes, very small unions in general. It also has to do with the interests they have. Unions also work as corporations that negotiate. For the larger unions, especially the industrial ones, it is very hard for them to embrace such as strategy. Smaller unions, or from specific crafts, are ever more interested in the subject, also because practically all of their companies are shutting down. For example, the union of marroquineros, leather workers, if it does not actively intervene to stop companies from shutting down or to recuperate them somehow, it is doomed to disappear because there will be no workers left. Because of this I see a growing support for this struggles from trade unions. RV: Turning now to political parties, in Argentina we find this strong ERT movement without there being a strong “workers’” party. How do the leftist parties position themselves vis-a-vis the ERT? Is it a struggle that is common to all of them? AR: No, leftist parties have not always been favourable to this question of recuperated workplaces. Some have, but here the left is a minority. Within peronismo we could say there is a left, and in general the left in peronismo is very favourable to the recuperated workplaces. I believe that in the large majority of ERT, the leaders identify themselves, despite all the contradictions, with this political position. The non-peronista left, be it trotskyist or otherwise, also has a very classical conception of class struggle, where self-management in general does not fit. Some have even declared themselves against self-management because, from their perspective, it does not contribute to the path towards revolution. This discussion was very visible in 2001-2002. There were recuperated companies whose leaders identified with some of these parties from the trotskyist left who were against forming cooperatives. Their goal was nationalisation, or state ownership, with worker control. This is a slogan that may be fine as an horizon, but which is unfeasible with a state that is not a revolutionary state, so to say. Therefore many of these cases ended up in dead ends. With each experience of a recuperated workplace, we can derive many things that question capitalism in its foundations: property, democracy in the workplace, the division of labour, horizontality, all of that. But that is not necessarily the goal of the recuperated workplace. The goal, first and foremost, is to safeguard jobs. The incomprehension from sectors of the left is due to a lack of ideological flexibility, but also a lack of presence in the working class. Because if it had delegates, workers in each of these experiences, it would understand them much more clearly. Not having them, and coming from the outside, it ends up clashing. To give an example, in 2001-2002 there were two cases that everyone was hearing about, both in Argentina and abroad, which were Zanon and Brukman,3  which had ties to the PTS [Socialist Workers’ Party], a trotskyist party that is now part of FIT [Workers’ Left Front]. In Zanon the leaders were trotskyist militants and their vision was widely shared by the collective, but in the end Zanon ended up forming its cooperative, and walking the same path as all the others, although it is a very interesting and creative experience. In Brukman it was different. The workers did not even have a union, the militants arrived from outside looking to direct the struggle, but the direction was according to the manual. And with the manual they were doomed. RV: In a 2006 article you talked about a “social innovation” component in the ERT. What is the importance of the ties to the community for these companies? AR: Nowadays I think I would not talk about “social innovation” because it is a term that is also being used from the neoliberal side. But yes, clearly there are changes in the economic rationale of a recuperated workplace, which articulates with the political and social spheres. And that would be this question of ties to the community, which I believe are important. Not all recuperated workplaces have this concern, or this strategy. For the most part, the opening up to the community is something that the workers see as positive, but also a strategy to build strong ties to the neighbourhood, to the people, articulating with organizations, etc. Because the ERT are often small or mid-size companies, and each on its own does not have the strength to implement self-management without these social networks of support, everything that mobilises around a recuperated workplace. 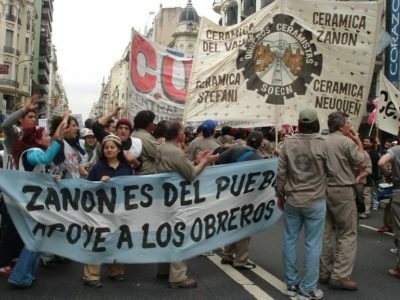 Workers’ assembly in Cerámica Zanon (Photo: La Izquierda Diario). AR: Of course. Since they transcend this logic, they break the concept that a company is a mere tool for the accumulation of capital. It is broken in two ways. For one, because the workers are not necessarily interested in accumulating capital. What they want is to keep their jobs, and they can possibly manage with much less than it would take for a capitalist to, within his rationale, keep the company running. At the same time, there is a risk that a recuperated workplace will operate in a conservative fashion, doing the bare minimum to survive, with no growth or renovation. There are ERT that have been around for several years, and it is clear that when the workers retire, or die, the cooperative will disappear. But if on the other hand we take into account this opening up to the community, reaching into social and political spheres, that is another avenue of growth that does not necessarily have to do with accumulation. RV: A study of around 100 ERT suggested that around 20% of their economic activity is with other ERT or with the solidarity economy. Do you think this is progress in terms of creating a sub-system that is not 100% capitalist? AR: Yes, but it is much harder than it sounds. The numbers, I believe, are not that high. We usually track this in our reports. But it is a necessary step, one which we are working on. Sometimes, precisely in the context of economic growth we had before, with a dynamic internal market, this was not seen as a priority because each company could survive on its own in the market. Now that the situation has completely turned, there is a bigger concern that there is a need to build links, even create a sort of special market, with different rules, that will allow both for survival and for growth. This will also demonstrate that an alternative is possible. Nevertheless, it is much more complicated than it looks, even with the 400 recuperated workplaces by themselves. We need to extend to other cooperatives, other types of organisations. In one case we are trying to articulate Textiles Pigüé, a very recent ERT that produces clothing for children, and another cooperative that produces fabric in the north of Argentina, and we are working on a common product. One of the ideas is also to place production in solidarity networks in Europe, not just for sale but also to bring these products to migrants and refugees. I do not believe the challenge is just to build chains inside the same sector. Textile factories do not just require products from other textile factories, the same for metallurgical ones. Production can be integrated in other chains and inputs can come from other sectors. We need to create wider networks and also fight in terms of consumption. This means getting people to consume products from sectors where there is no exploitation of labour, or at least not to the same degree as in capitalist companies, and where environmental concerns are taken into account. There are a number of struggles ahead. But this one is a struggle against capitalism in its economic core. RV: In your opinion, where does the state stand in all of this? Sometimes a very romantic vision is generated, of an ecosystem on the margins of capitalism, but is there not still a need to struggle for the state? AR: Yes, I think this struggle for the state should not be abandoned. This romantic vision exists, of creating a ghetto where we, the good guys, stand, without capitalism or the state. But the state will still exist. Both the state and capital will not sit idly by while we build the economy of the future! In fact, the experiences of the recuperated workplaces have shown time and again that the struggle is always on 2 or 3 fronts at the same time, against the capitalist market, against the state, even when the state thinks it is helping. Worker in Imprenta Chilavert. (Photo: Taringa). Therefore, obviously all the state policy tools we can put to use to strengthen the movement need to be used. No matter how much we want to stay outside or want nothing to do with the state, the state still wants something to do with you. That is the question. And although the neoliberal state is weak in terms of allowing financial capital and large corporations to run rampant, it remains strong and repressive in what regards us, with no concern for legality whatsoever. RV: Almost all the ERT form cooperatives. Is there a difference between these cooperatives and others which are not borne out of this struggle to preserve labour posts? AR: Indeed. In general the discourse we find among the workers in recuperated workplaces is that they are cooperatives out of necessity. Because there is also a romantic vision of cooperatives like the one we were just discussing. Even within this more traditional cooperative movement, for a long time the ERT were questioned because they were not true cooperatives, they were so only out of necessity, did not share the values, etc. And in truth this sector is reviving this old cooperativism, giving it a content that had been lost, of a cooperativism which is not just about companies coexisting with capitalism with no issues whatsoever. On the contrary, they are part of the same capitalist economy with almost no contradictions. Of course, a cooperative is not the same as a corporation, a capitalist company with a boss, but in many cases it is hard to tell them apart. In general the juridical form is called work cooperative, in the case of the ERT these are cooperatives of the workers. This is not the same as a consumption cooperative, or a credit one, or a housing one, or one that provides services, and which in turn hires workers. AR: Precisely. Even the non-exploitation of labour is not a cooperative principle, for example. Cooperatives will often outsource work or exploit workers just like other companies. I believe the emergence of these cooperatives, the ERT, has generated an important contradiction inside this more traditional cooperativism. It is a breath of fresh air that is bringing back an old tool, which at its inception belonged to the workers. RV: In their struggle to survive in a capitalist market, the ERT will also be tempted to sub-contract workers, or resort to other practices of capitalist companies. Are these contradictions that need to be confronted all the time? AR: I believe so. The ERT emerge from different kinds of workers’ struggles. Therefore, at least at the beginning, they are more or less vaccinated against the exploitation of other people. Not necessarily against their own self-exploitation, which is an equally complicated matter. Now, as time passes, the market mechanisms also influence and condition self-managed companies that emerge within capitalism, because it is not a case of a movement that is fighting capitalism and building something else. Rather, these emerge as solutions to the very problems and the lack of options that labour faces in capitalism nowadays. Therefore, within this context there can very well be processes of bureaucratisation, or of the leaders identifying with market values such as competitiveness, efficiency, etc., and starting to see that the economic viability of the company requires certain kinds of practices. The fact that one works in a context of self-management/workers’ control does not imply that one has the conscience that this is the economic system worth promoting. It is an ongoing struggle to learn from the self-management experience and to change how we envision labour. • Andrés Ruggeri is an anthropologist and directs, since 2002, the Facultad Abierta programme in the School of Philosophy and Literature of the University of Buenos Aires, dedicated especially to the issue of workplaces recuperated by workers. He is the author or co-author of several works on this subject [in Spanish], including Qué Son Las Empresas Recuperadas (What are the recuperated workplaces) and Crisis y Autogestión en el Siglo XXI (Crisis and self-management in the XXI century). Ruggeri is also the director of the Autogestión magazine. This article was posted on Tuesday, November 13th, 2018 at 4:17pm and is filed under Argentina, Co-operatives, Interview, Labor, Recuperated Workplaces, Unions.